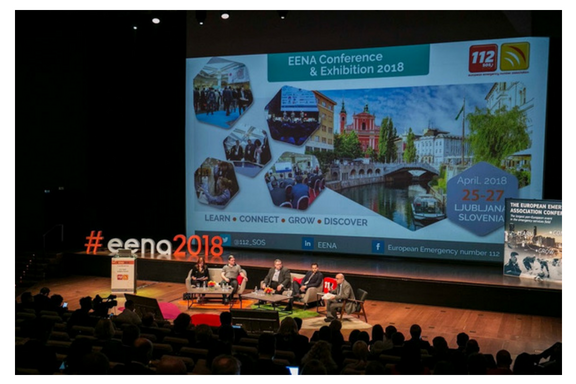 Spring ended with Eurisy attending the European Emergency Number Alliance’s 2018 EENA Conference & Exhibition in Ljubljana, Slovenia. Set up in 1999, the Brussels-based NGO has been doing great work on promoting high-quality emergency services reached by the number 112 throughout the EU. On the agenda – new technologies and innovation. Or rather how new technologies can benefit and/or support emergency and crisis response services. For Eurisy, this was an opportunity to put satellite applications on the agenda! And so we did, with a presentation at the Innovation Theatre (available here) which shared our findings so far in the Satellite applications for the alps: search and rescue project and in particular how we’ve seen users use satellite applications to assist emergency response operations and search and rescue. The event was attended by over 720 delegates from more than 50 countries worldwide. Different emergency response organisations, service providers, legislators and other stakeholders gathered to exchange on the hottest topics concerning public safety. 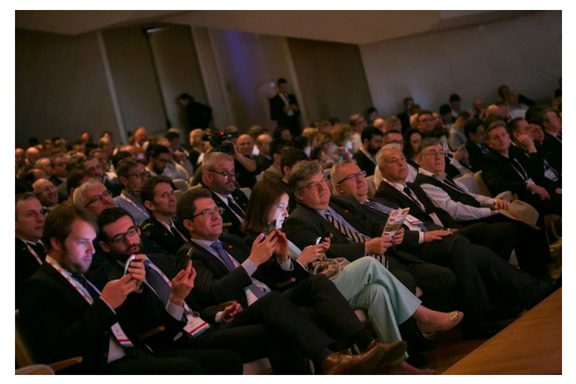 From augmented reality, drones, artificial Intelligence (or “Intelligent Assistant” as Corti Founder and CEO, Andreas Cleve put it) to data sharing standards, eCall and emergency call taking, the three day event was rich in feedback and uncharted user challenges for Eurisy. Most of the new technologies that were hot topics for the event including the use of drones, eCall, AML, etc, rely on a satellite component, yet few referenced them. Whilst some of the users were aware of Earth Observation data, when enquired, they had limited knowledge on the data sources feeding their mapping solutions. Favourably, both Galileo and Copernicus programmes were highlighted during the event, with the Copernicus Emergency Management Service Mapping being presented alongside GRALLE, a EU initiative for a Galileo-based Emergency Warning System. Satellite navigation in particular was at the heart of many current and emerging applications. For instance, the Slovenian emergency call centre present at the event was happy to share how they use GNSS to automatically dispatch the most nearby available ambulance, as soon as the caller’s location is understood. Other examples included a number of alternative emergency call applications for cars and mobile phones. These would all make use of GNSS to share more accurate location information than what is currently shared when relying on cellular network location. eCall, which builds on E112 and GNSS services, and which mandates the installation of a device that can automatically dial 112 in the event of a serious road accident on all vehicles, has become operational since April 2018. Whilst users have not reported particular technological problems in implementing the new service, remaining issues relate rather to interoperability, updating legislation and/or identifying between fake and actual calls. Take the Spanish case where 112 is a regional competence. In Spain there are 19 regional PSAPs (Public Safety Answering Points), each with its own proprietary reporting formats, procedures and structures. As such, a considerable amount of time has been spent on multi-lateral service agreements and cross-PSAPs trainings. If we go cross-border, the challenge increases. For example, there is no integration of systems between Ireland and the UK when it comes to emergency calls and sharing relevant location data. Talking on Google SOS Alarm system, Sims Witherspoon, argued that a map should tell a particular story, not all of them. As such, mapping companies should first and foremost, know their users. A message Eurisy has put forward time and time again. If you are travelling on the underground, you don’t need to know what happens above ground. For Google, alongside first responders, the crowd is their most valuable source of information. While it cannot replace a public agency, it wishes to act as an amplifier for public alerts through their ELS features (Emergency Location Service). “Why build several mapping systems when one already connects a critical mass of users?” they ask. “If you build it, that does not mean people will come” Ed Parsons from OGC W3C representative argued. In his view, information findability of such emergency apps or mapping services is amongst the major challenges to their take-up by users. Numerous emergency calling Apps relaying on Satnav were presented alongside their common hurdle – the need for a critical mass of users to make them relevant. 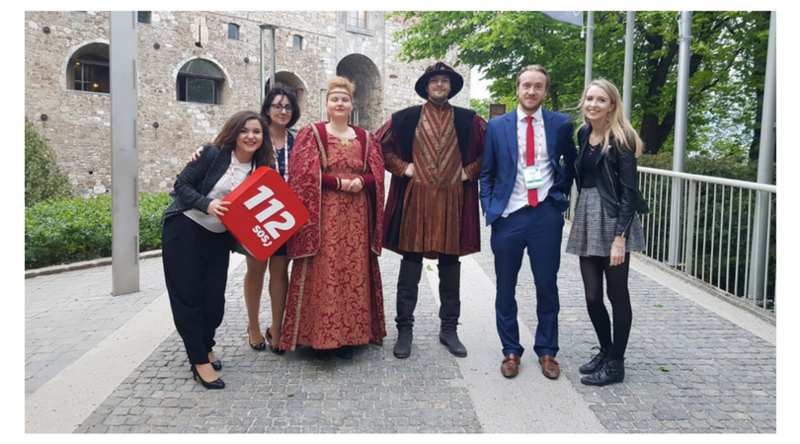 Among the successful cases presented was Finland’s free 112 App which has registered 1,5 million downloads since its launch in 2015 (population of Finland is 5,5 M) without major marketing campaigns. The future of such 112 applications after AML (Automatic Mobile Location) deployment was also put into question, as the new system would make them redundant. According to some guest speakers, 112 applications need to develop into a new kind of service that provides other kind of added value instead of being restricted to geo-location data. As we’ve frequently reported in the past, the barriers to user-uptake of new services are seldom due to limitations to the technology itself. According to 112 Iceland representatives, these days they spend less time searching for people and more time in dealing with digital and data analytics illiteracy, trainings, data sharing standards and flying drones. Such challenges, including integrating new solutions to existing workflows, political and legal questions, are more likely obstacles. This was very much the case also at the EENA 2018 conference. The Advanced Mobile Location system (AML) - recommended in Eurisy’s policy brief from the Satellite Applications for the Alps project and featuring in the good practice database – is currently at the very same stage. This solution would enable the transmission of accurate handset-derived location data directly to emergency services, via SMES or HTTPS. For Marko Nieminen, Director of Finland’s ERC Services, accurate and automatic location is crucial considering the country’s wide area and low population density. Finland is also one of the few European countries which implemented AML. Thanks to the new feature the accuracy has been lower than 50 metres in 77% of emergency messages received since the system’s roll-out at the end of 2017. While it is clear to users that the technology helps save lives and adds convenience to the emergency response procedures, its implementation is nevertheless hindered. According to Bjorn Skoglund, from the Swedish 112 & Crisis Management Service Developer, the centre has been ready to deploy Advanced Mobile Location (AML) implementation for the past two years. In Sweden, current legislation dictates that when a person calls an emergency number, their location must pass through and be provided by telecom-network providers. Legislation change is a long a lengthy process. As such, the authority neither has the political mandate to change existing legislation, nor the competences to advocate for it. The situation is similar in several European countries with only six countries to fully or partially deploy AML (Austria, Estonia, Lithuania, Belgium, Iceland, Finland, Ireland). Therefore, local and regional users are setting their hopes in a future European directive – like eCall - that will oblige their national governments to align their practices and adopt AML across the board. As with E-call, there is still much work to be done ranging from making AML available on IPhones (Android is already compliant), to setting common standards and compliance mechanisms. Harmonizing legislation across EU countries will be at the heart of it all. Drawing on the user testimonials collected from Search & Rescue organisations, Eurisy has identified a clear desire among participating organisations for AML and other satellite enabled location systems to be taken-up as an integrated part of the emergency number. For them, the difference in accuracy between a 1km and a 50 metres one, translates into shorter intervention times and lives saved. As such, pushing this initiative forward and supporting EENA’s work will be something we’ll be looking forward to do!